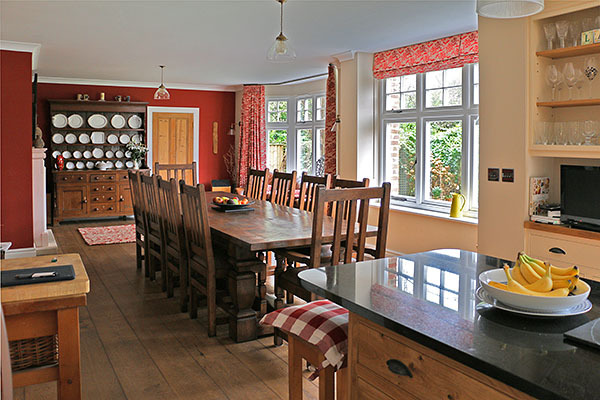 A bespoke handmade Arts and Crafts style heavy oak table, side chairs and armchairs, shown here in the dining/kitchen room of our clients Dorset village house. The table has hand cut square baluster legs and the chairs, with scaled down versions, have leather upholstered drop in seat cushions. As specified by our client, the oak has been 'Medium Aged' and finished in our 'Aged Sienna' colour, with a matt sealer coat and waxed. To see this dining set, viewed from the opposite direction, click: Heavy oak table & matching chairs in traditional interior.